Taking RMS Ports to new heights with a fresh website and stunning aerial video content! 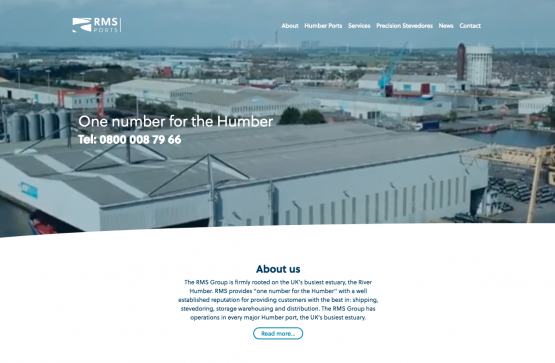 RMS Humber are a shipping and ports company who came to us needing a brand new look for their website. We worked on totally redesigning the site's look and feel, whilst keeping their core services & key messages at the forefront. One priority for RMS, was to ensure the website was optimized for mobile, something the previous site lacked. This along with a need for a more user-friendly interface, led the web team to advise the client on the chosen format, which we think looks clean, contemporary & effective! The Humber Ports from above! We got some great shots of RMS locations across The Humber using our drone! 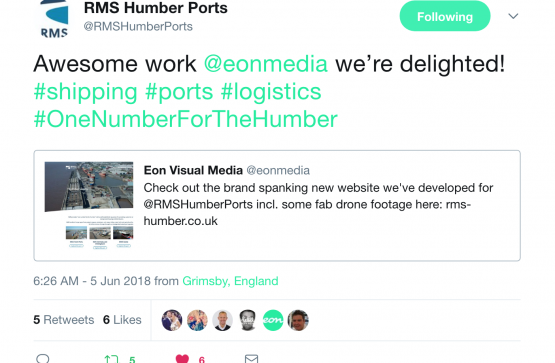 The video content covers locations in Grimsby, Hull, Flixborough & Goole and is being used on the shiny new website we developed for the shipping & logistics company. We strive to put smiles on our clients' faces, so we love it when we get fab feedback like this! "RMS’s online presence had become a little dated, we wanted to refresh our website and branding with a clear focus on our port based activities. Eon were great, from the initial meeting, to outline concepts through production and final delivery. They updated our logo and rejuvenated our website with new images and video content. Eon were also responsible for filming all the video content. The video team were great to have on site and really captured what RMS does. We would recommend Eon to others looking to update their branding and online presence."